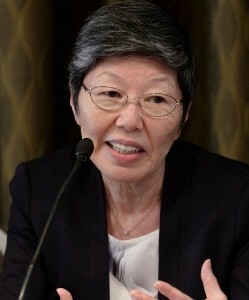 Yuko Harayama re-joined the Council for Science and Technology Policy, Cabinet Office of Japan, as an Executive Member. She is the former Deputy Director of the Directorate for Science, Technology and Industry, Organisation for Economic Co-operation and Development (OECD). She is a Legion D’Honneur recipient (Chevalier), recognized by the President of France for her research on science and technology policy. Previously, she was Professor in the Management Science and Technology Department at the Graduate School of Engineering of Tohoku University. Dr. Harayama holds a Ph.D. in education sciences and a Ph.D. in economics, both from the University of Geneva. Prior to joining Tohoku University, she was a Fellow at the Research Institute of Economy, Trade and Industry in Japan and an Assistant Professor in the Department of Political Economy at the University of Geneva.